Save the Sound uses legal expertise, grassroots advocacy, volunteer work, and habitat restoration to preserve great coastal and island sites, fight for clean water, restore rivers and marshes, and clean up hundreds of miles of coastline to preserve and protect Long Island Sound. In 2004, Save the Sound merged with Connecticut Fund for the Environment and continues to advocate against threats to Long Island Sound in both New York and Connecticut. Every year, beaches and shellfish beds are closed up and down Long Island Sound. And every year, hundreds of acres of the Sound are plagued by a low-oxygen dead zone, suffocating fish and other marine life. The culprit? Over two billion gallons of raw sewage, excess nitrogen from wastewater treatment plants, and stormwater pollution. Caused in large part by high levels of nitrogen from multiple sources, like sewage, it creates low oxygen levels in the water column. Extra nitrogen from sewage and other sources provides food for massive quantities of algae. As the algae die, they use the available oxygen in the water and hypoxic conditions appear. Serious hypoxia affects the western Sound each July and August, causing major damage to the local ecosystem. Beach closures prevent citizens from enjoying their natural resources and damage the tourism industry. In Westchester County alone, there were 136 beach closings in 2013, 112 in 2012, and 140 in 2011. 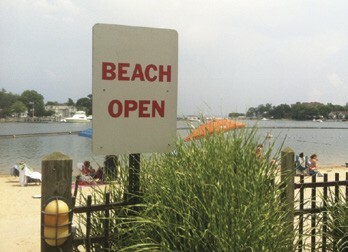 Connecticut had 298 beach closings in 2012 and a whopping 538 in 2011. Many closures last multiple days. Where is this sewage coming from? First, wastewater treatment plants in many communities discharge nitrogen into the Sound and its tributaries as part of their sewage treatment process. Second, older cities often have combined sewage and stormwater that dump a mix of raw sewage and rain into the Sound and rivers when it rains, in a combined sewer overflow (CSO). Third, sewers in many towns are old and cracked, and can easily be infiltrated by stormwater that forces sewage out before it can reach treatment plants. These CSOs and cracked pipes pollute and close beaches and shellfish beds with disease-causing bacteria, while the excess nitrogen from the sewage treatment plants and raw sewage contribute to the dead zone. Thankfully, progress is already being made to fight the dead zone. Fifteen years ago, New York, Connecticut, and the Environmental Protection Agency decided that sewage treatment plants needed to reduce nitrogen pollution 58.5% by 2014 in Connecticut and 2017 in New York. Connecticut met this target last year, thanks to the Clean Water Fund (CWF). The CWF helps municipalities pay for sewer system and treatment plant upgrades, benefiting job creation, the economy, clean water, and open beaches. It helps keep sewage out of our rivers, shrink the dead zone, and make sure residents and visitors alike can enjoy our beaches and local shellfish. This year and next, the CWF will fund $162 million for CSO projects in New Haven, Hartford, Bridgeport and Middletown, $40 million for green infrastructure, and $8 million for climate change resiliency. New York’s progress has been slower. Save the Sound recently published “Healing the Sound’s Dead Zone: Are New York’s Sewage Treatment Plants Making the Grade?” Nassau and Suffolk counties received As and Westchester County and New York City received Bs – meaning they’re on track, but still have work to do before 2017. Visit savethesound.org to see the full report. Now we must take the next critical steps. It’s time for Connecticut River states like Massachusetts, Vermont and New Hampshire to curb their impacts on downstream ecosystems. Researchers and farmers around the Sound are starting to grow and harvest shellfish and seaweed to remove significant amounts of nitrogen. Expanding the market for these Sound-sourced products will be both an environmental and economic boon. You can help reduce sewage pollution, eliminate the dead zone, and keep our beaches clean. Tell your elected officials you support investment in sewage infrastructure. Don’t hook up your gutters to sewers, and report illegal storm drain hook-ups. Use only small amounts of organic fertilizer, compost, and grass clippings to keep extra nitrogen from entering the Sound. You can even monitor water quality and spot sewage leaks yourself by joining Save the Sound’s Pollution Patrol. Want to know if the beaches in your area are closed? Sign up to receive our Sound Swim Alerts. Restoring Long Island Sound to health is a long-term project. But with ongoing commitment from state lawmakers, local leaders, and the region’s residents to make the investments needed, we can return the Sound to vitality.